Last week I stepped in for a bonus Secret Recipe club reveal, so I’m back today with my group! In SRC, participants are secretly assigned another blog, search the recipes, make something amazing, & then reveal. Interested in joining? Click that link for all the info! This month, I was assigned Dena’s blog, Oh! You Cook! Dena shares amazingly delicious kosher recipes and is the author of the Everything Kosher Slowcooker Cookbook! There were tons of recipes I wanted to try, like Brisket, but ultimately challah bread won me over! I made challah once before, but this recipe was a bit different than the other, so I wanted to give it a try! Plus, I wanted to try out a different braid this time! This challah is soft, and rich and absolute perfection! I’m pretty sure I could eat and entire loaf myself, however, most of this particular challah was used in another recipe. But that’s a story for another day, stay tuned! And thank you Dena for another amazing bread to add to my repertoire! 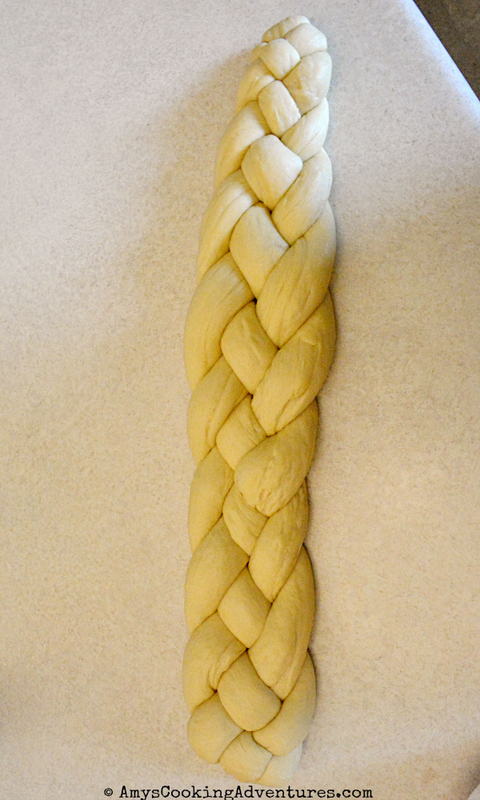 -I allowed by dough to rise twice so the ropes would be more stable for braiding. You can skip the second rise, but the braid may not come out quite as evenly. Adapted slightly from Oh! You Cook! Separate 1 egg, placing the yolk and white into separate small bowls (you’ll need the white for the bread and the yolk for the egg wash). Place 3 ½ cups flour, yeast, and salt into the bowl of a stand mixer, whisk to combine. Add the oil, whole egg, the egg white from the other egg, honey and water. Stir on low with the paddle attachment until combined. Switch to the dough hook, slowly add the flour, mixing on low until the dough is no longer sticky. Knead with the dough hook for an additional 2-3 minutes. Lightly spray a large bowl with non stick spray. Place the dough in the bowl, turning to coat. Cover the bowl loosely with plastic wrap or a damp kitchen towel and place in a warm, draft free area to rise for 45 minutes (I used the proof setting on my oven). Punch down the dough. Cover again, and allow the dough to rise for another 45 minutes in the same warm, draft free area. Take each of the 4 pieces of dough and roll them into equal length ropes. On one end, lightly press the 4 ends together. Starting on one side, begin weaving in and over-under-over pattern. Take the next available rope from the same side and weave over-under-over. Repeat until all of the dough is braided/weaved. Pinch together the ends, and tuck under slightly. If desired, un-pinch the dough from the beginning and reweave, reversing the pattern (over-under-over, but from the other side) to make the weave even. Carefully move the loaf to and ungreased baking sheet (lined with parchment of a silicone mat, if desired). Cover loosely with a damp kitchen towel and allow the dough to rise in a warm area until doubled in size, about 1 hour. Whisk together the egg yolk and the remaining 1 tablespoon of water. Use a pastry brush to gently cover the entire challah loaf. Bake the in preheated oven for 35 minutes, or until golden-brown. Immediately remove the loaf to a wire rack and cool completely. Your Challah bread is beautiful! I would love a slice right now with a bit of butter! 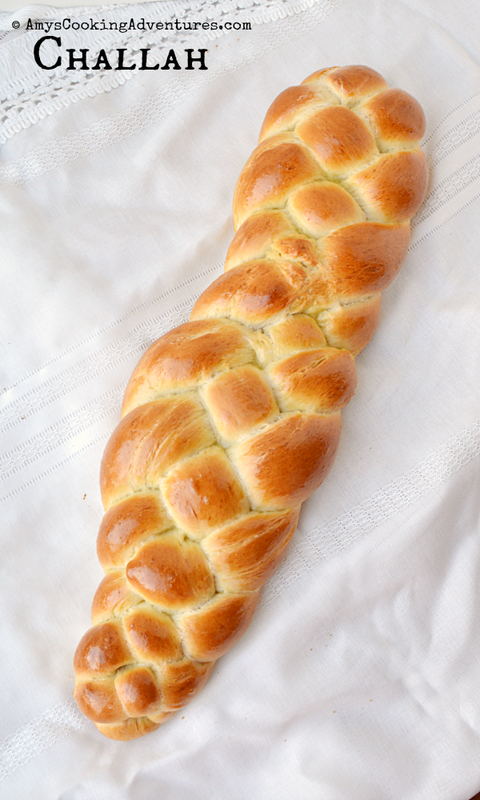 I have never eaten (or made) Challah bread myself... but I would love to give it a try! It looks beautiful and such a long braided loaf too! Very impressed! Just gorgeous, can't wait to see what you made with it. This is so on my "bucket list". That is a gorgeous loaf of bread!! That bread so yummy! Great choice for this month. Beautiful bread! I've never made this but have always wanted to! Happy reveal day. Challah has always been one of my favorite breads but I've never tried making it myself. I'm going to have to learn your braiding technique. Looks delish! You did a great job! And your photos are gorgeous! So so beautiful. Making this bread is on my bucket list. What a perfect braid! This bread has been on my bucket list forever. HOLLLAAAAA that is one BEEEAUTIFUL challah!